Over the last couple of years we have seen a change in the way technology has addressed BI, artificial intelligence and machine learning. Previously seen as experimental or theoretical territory in the world of sci-fi, they started to emerge into the sphere of enterprise and industry, albeit as a separate piece of technology. 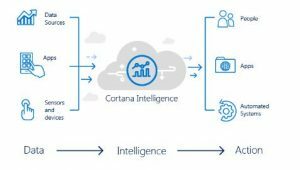 Microsoft are driving the concept of “modern BI” within our day-to-day business applications so that organisations are not investing in or deploying BI as a separate IT decision (look at Dynamics 365, Dynamics NAV 2017 for example) and now we are seeing Cortana Intelligence capabilities merging into our daily lives. If you have used a Microsoft mobile phone or Windows 10, you will be familiar with how Cortana assists with decision making and alerts, learning the more it carries out for you. This functionality now works within Microsoft Dynamics for example to help with sales pipeline management to spot trends and prompt actions on your client base or nurturing prospects. The benefits of Cortana is now available on a wider and deeper level, giving developers to leverage across their applications and devices. This video demonstration shows how integrated the functionality can be in a normal business day; from contextual push notifications and reminders for meetings, traffic, networking (LinkedIn, Skype for Business), and collaboration (Microsoft Teams). What technology makes this possible? 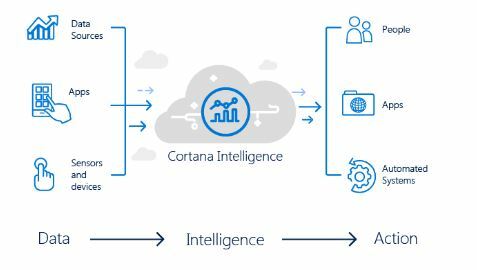 What is Cortana Intelligence suite? The cloud platform helps us “turn data into actionable insight” which means that although businesses may have various data points where employees, customers and partners etc are interacting with us (big data); the real value is what information and advice we get from this data. In April at the Data Amp event, Microsoft announced updates to the forthcoming SQL Server 2017 that will make it easier for developers using Microsoft tools to bring this deep learning intelligence into their own applications in their own databases. Prepackaged learning solutions from Microsoft Cognitive Services are also being updated, all of which means that this technology becomes more easily available. Speak to Prodware about how our in-house Microsoft development team can bring your data to real life. Lynne's role at Prodware as Project Manager helps clients to achieve their technology ambitions within best practice frameworks. Lynne has over 20 years' IT programme experience in change management through technology, across ERP, CRM, financial solutions from business case preparation, initial scoping through to implementation and training.